Jordan Brand, a division of Nike, has tipped off the NBA All Star festivities in New Orleans with class by donating $500,000 to benefit the Boys & Girls Club of Southeast Louisiana's Slidell Unit. Basketball legend Michael Jordan and All-Stars Carmelo Anthony and Chris Paul were joined by more than 250 community leaders and New Orleans-area youth for the official dedication and check presentation ceremony. The Slidell Boys & Girls Club was one of 16 Gulf region Boys’ & Girls’ Clubs damaged in Hurricane Katrina. The location was completely gutted, and the facilities were in ruins. 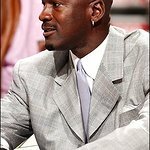 But the Jordan Brand donation is about to change that, as the hefty donation is earmarked towards the construction of a new state-of-the-art gymnasium named after Jordan Brand. The facility will be complete with a professional basketball court, scoreboard, and bleachers to be used by the children of the Boys’ & Girls’ Club and other related community groups. Jordan Brand believes that physical activity plays a vital role in building character in youth, and donations back up their beliefs. In 2006, Jordan Brand donated $450,000 to Habitat For Humanity to aid in the rebuilding efforts in Louisiana. By auctioning off 21 pairs of Michael Jordan autographed AIR JORDAN shoes to raise the funds, the money helped rebuild homes in the Lower 9th Ward of New Orleans.